My experiences with seafood boils has been either very good or very bad. Generally, the ones I've had out-of-town have been more consistent than the ones I've had locally in the GVRD. I'm not sure why we just can't seem to do it right here. Could it be the operating and material costs? Or does it have to do something with taxes? Maybe we just can't boil seafood? Whatever the case, I'm still trying to get over Crawfish King and that was like over 4 years ago! Somehow, the craze died down for a little while, but it seems to have started up again. 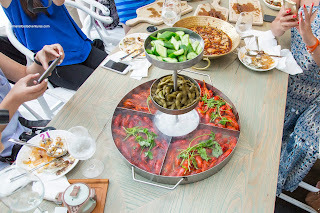 I recently got to check out one of the new spots in 21 Nautical Miles as part of ChineseBites Oceanwise dinner. Getting down and dirty, we were served the main event first with 4 different flavours of Seafood Boil. In each pile, we found corn, potatoes, clams, blue mussels, selva tiger prawns and BC dungeness crab with add-ons of lobster tail, snow crab and king crab. I found that the seafood was actually cooked quite well. The Garlic Butter was the most mild of the 4 with a bevy of minced garlic coating each piece. Hence, it was very aromatic and pungent. 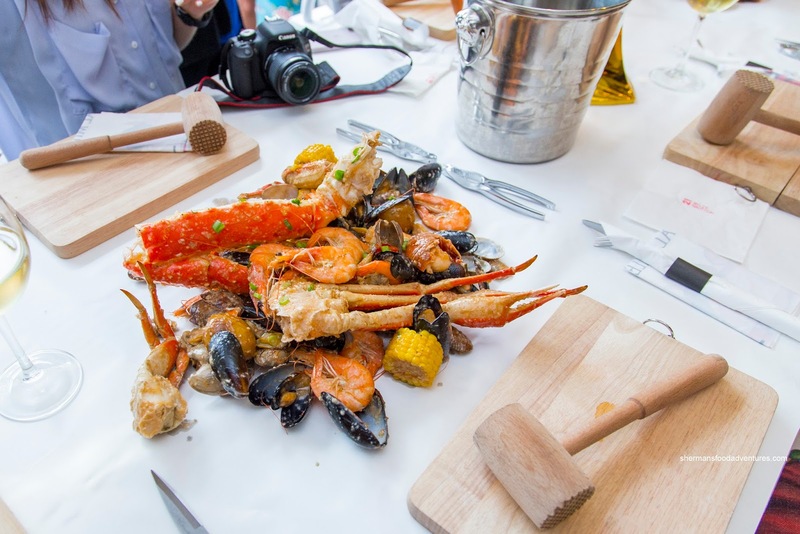 I thought they did a good job in limiting the amount of salt, which let the seafood do the heavy lifting. Directly in front of myself and Joyce was the Xi'an Spicy and it wasn't fooling around. There was a definite kick of heat from the get-go which continued to the very end (lingering as well). 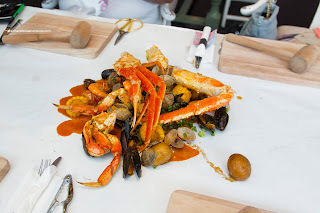 Despite this, there was still layers of flavour including the seafood and a background saltiness and sweetness. That was directly the opposite with the House Special Spicy which was even spicier. I found it somewhat tart with an almost overpowering heat that overwhelmed the delicate seafood. 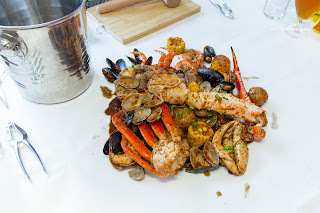 The clams, mussels and shrimp were a little lost, yet at the same time, the crab was okay due to it being in the shell. It was spicy, but it did not penetrate to the leg meat as badly. With a totally different flavour profile, the Black Pepper was spicy on a different level. It was more mild, yet had considerable impact. 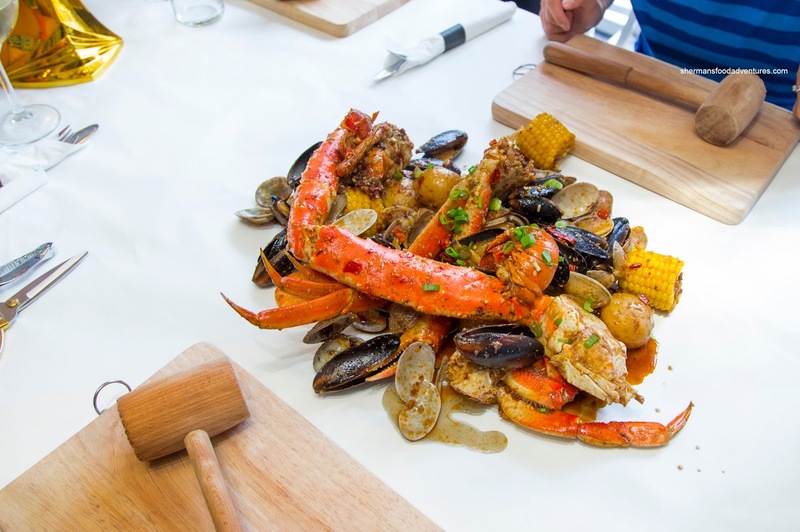 From the initial smell to actually touching the palate, the black pepper was a flavourful match for the seafood. Some might think it could be too strong, but I found it just right. While we were attacking the seafood, we were served a big plate of Fried Crab and Shrimp that had been fried and then wok-tossed in a spicy fried garlic and crumb mixture. 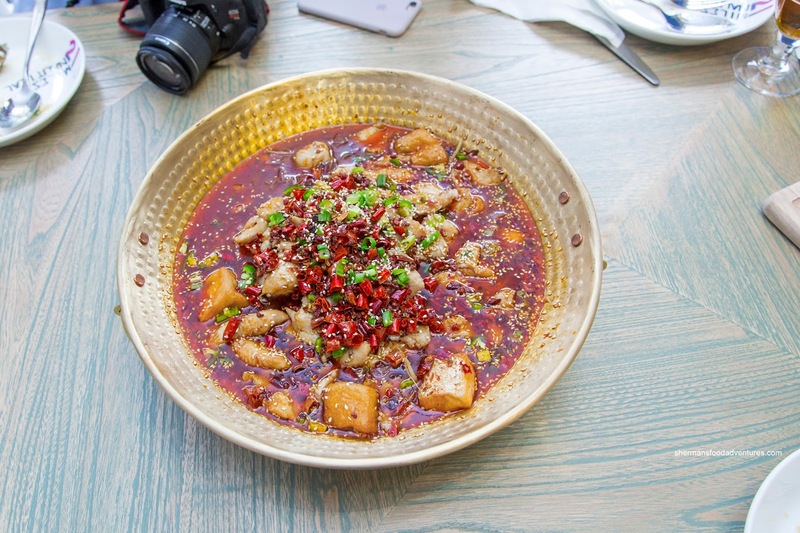 Hidden within was Szechuan peppercorns that caused my tongue to go numb on several occasions. Hence, the seafood was more of a textural entity rather than being anything on its own. I couldn't taste really anything for a bit after eating the crispy and spicy crumb coating. We somehow went away from seafood and were presented with both Lamb and Beef Skewers. Both featured tender and lightly charred meat, yet the textures were vastly different. The fatty lamb was moist and succulent while the beef was a touch dry and sported a more firm bark. 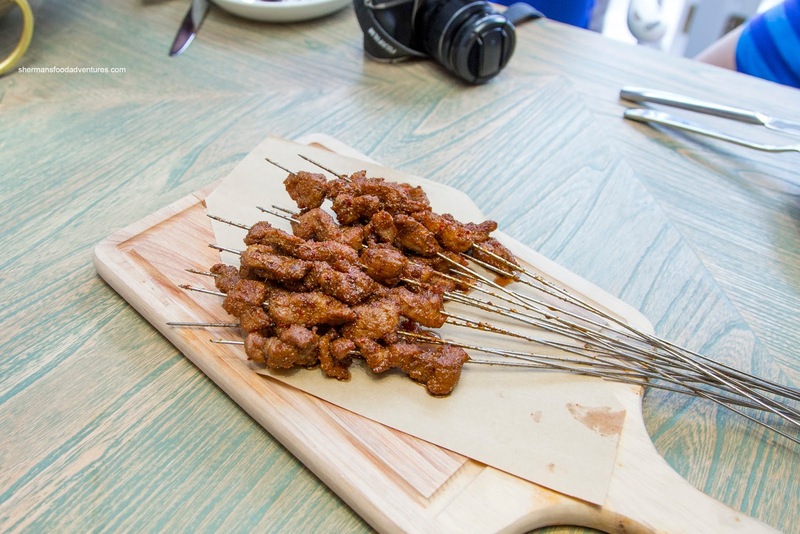 Dusted with cumin, the lamb had a distinctive taste and the beef benefitted from an aggressive rub that made it somewhat salty, yet flavourful and aromatic. 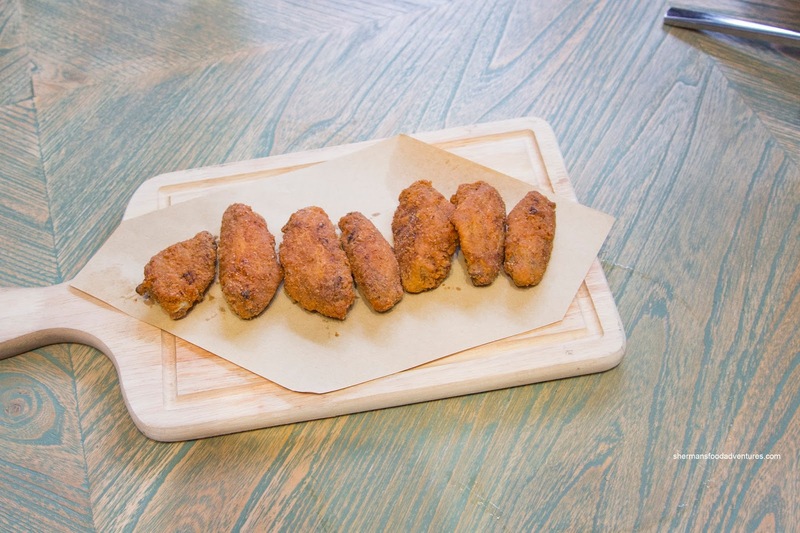 Looking rather plain, the Fried Chicken Wings were succulent inside while firmly and densely crunchy on the outside. There was lots of impact from the sprinkle of spices including preserved plum and MSG. 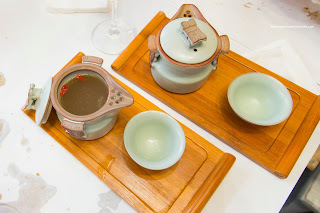 We then got an amazing concentrated Kung Fu Soup (Abalone Broth) served in a cute little teapot accompanied by an equally cute tea cup. I could smell the aromatic and sweet broth before I tried it. One sip and it didn't disappoint with a pointed sweet brininess that was both rich and exhibited depth. 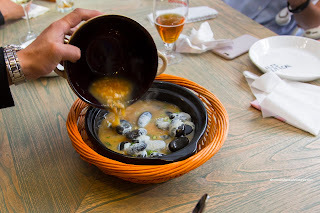 It was unmistakably abalone and was not over-salted, which meant the natural flavours came through. From subtle, we went full-bore with the Szechuan Boiled Fish. This one was pretty legit with tender nuggets of flaky fish sitting in a spicy tongue-numbing broth. Underneath, there were some cellophane noodles that had soaked up all the spice. I would've liked to see a bit more variation in flavours though. 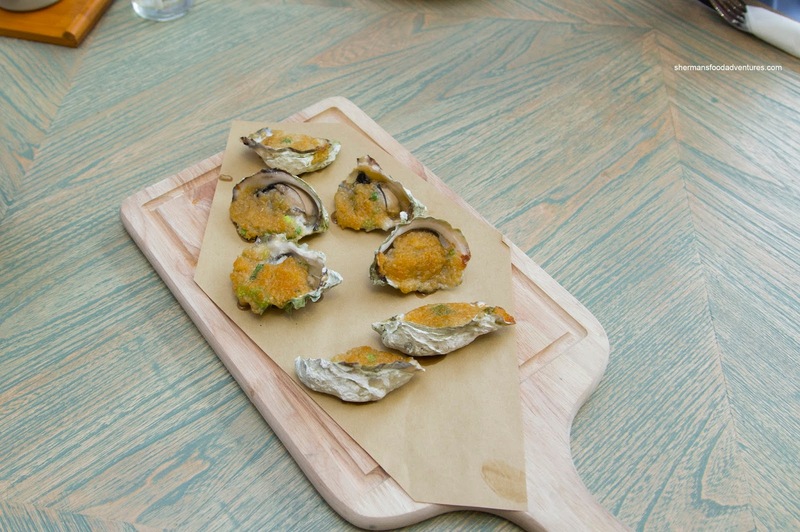 To further enrich our seafood experience, we were served the Grilled Oysters topped with plenty of garlic. Suffice to say, that was the dominant flavour with a well-seasoned pungency. However, the buttery oyster underneath wasn't completely overwhelmed as I got the brininess since it wasn't overcooked. Poured over hot rocks, the Stone Cooked Scrambled Eggs was both unique and actually quite good. It looked gimmicky at first, but the eggs turned out to be silky and barely cooked. I liked the mild seasoning that was well-balanced as well as the buttery shrimp. Looking rather impressive with activated dry ice, the Tower of Crawfish laced in the same 4 sauces arrived majestically. For me, I find crawfish a lot of work for so little meat. This was not different, however, the meat was fairly food being moist with a meaty chew. The flavours were pretty much the same as the seafood boil except I found only the Spicy and Black Pepper to be the best matches for the muddy-flavoured meat. 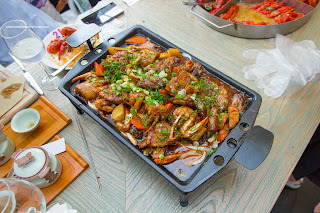 Our last surprise dish consisted of Blue Crab in Chef's Special Sauce with wings, chicken feet, carrots and potato in a sauce that could only be described as multi-faceted. There was so much going on that every taste on one's tongue was represented. With that being said, it was on the sweeter side, yet matched the crab well. 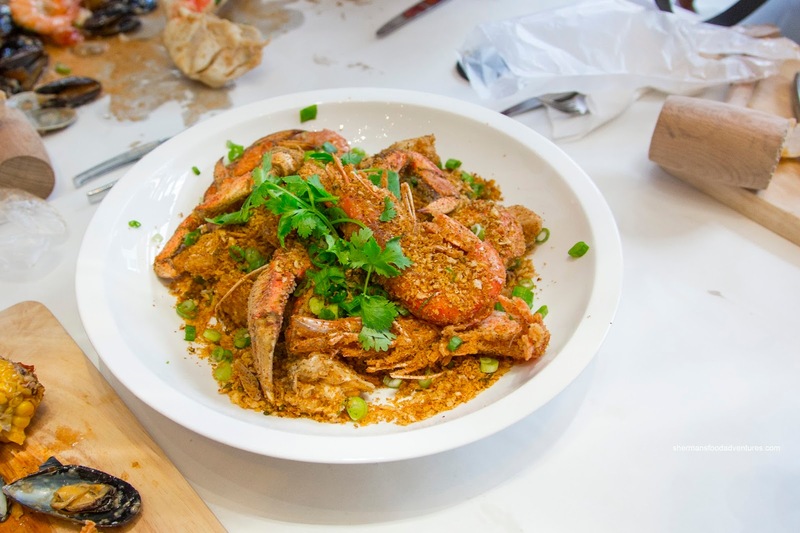 I actually thought the rest of the ingredients were more appealing to eat than the crab (as blue crab has limited meat). For dessert, we were served a Mango Thousand Layer Mille Crepe that was imported from Asia. 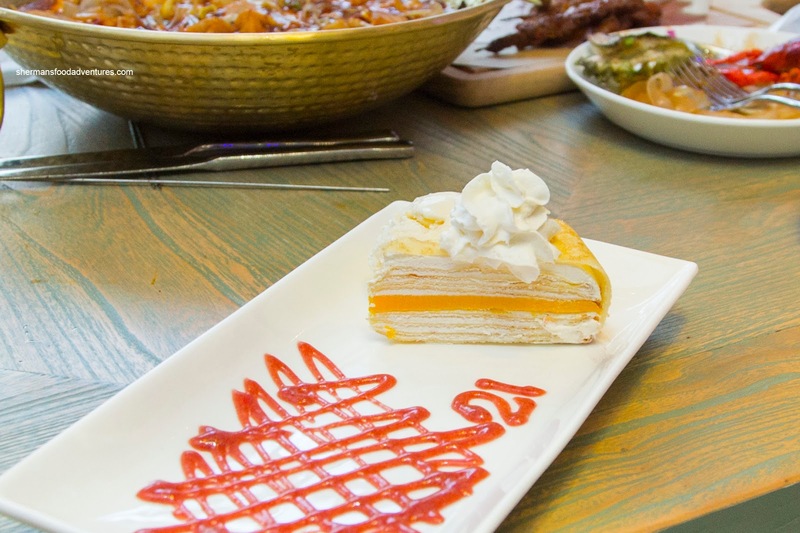 It featured light and slightly chewy crepes, fresh cream and ripe mango. The ice cream was a bit icy though. 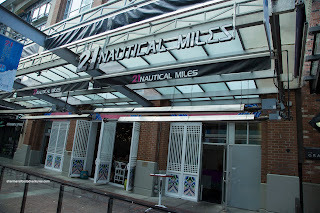 Overall, our experience at 21 Nautical Miles was pretty decent. It was a bit surprising considering some of the previous feedback from others. I guess they made some tweaks to ensure that the seafood wasn't overdone. 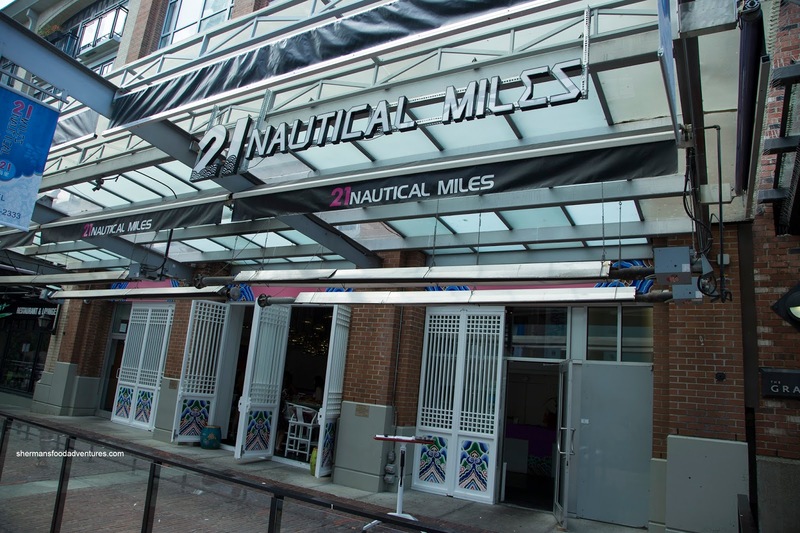 As with anything seafood and located in Downtown, you will need to make sure your credit card has been paid off first.